Very quick entry, as there isn’t a great deal to really say about this one. A quite bizzare advert showed up from Mirage Software in Home Computer Weekly, mostly asking for programmers and then advertising a title for the C64 and also for the Spectrum. 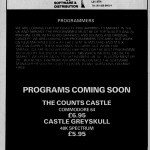 The C64 game was called "The Count’s Castle", the Spectrum game was "Castle Greyskull". Neither seem to have surfaced. So was it because Mirage were closed down due to the He-man based game?…. What happened?